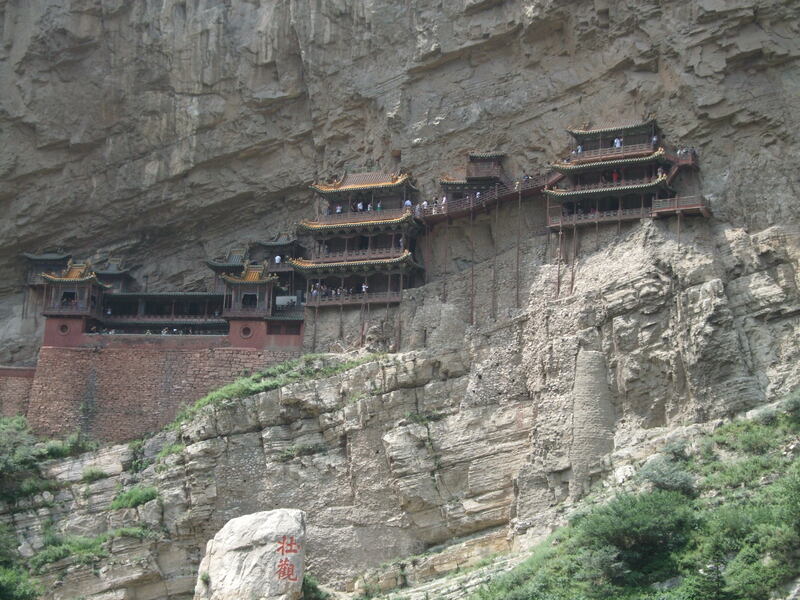 August 5, 2010: Yesterday, we visited the hanging monastery outside of Datong. It is breathtakingly beautiful, yet also, in a way, sad. 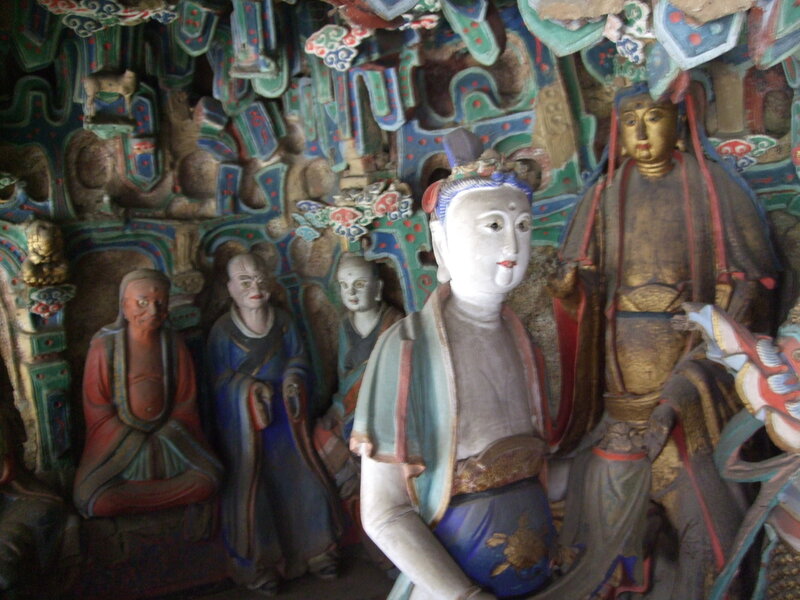 The monastery was built about 1400 years ago up on the side of a cliff, and contains several temples of various sorts with statues of buddhas and other gods in them. It’s not any bigger than you see in the photo: the monks did not carve caves into the cliffs, but built walls onto the cliffs to support their structures. As you can see from the photos, the workmanship is beautiful. 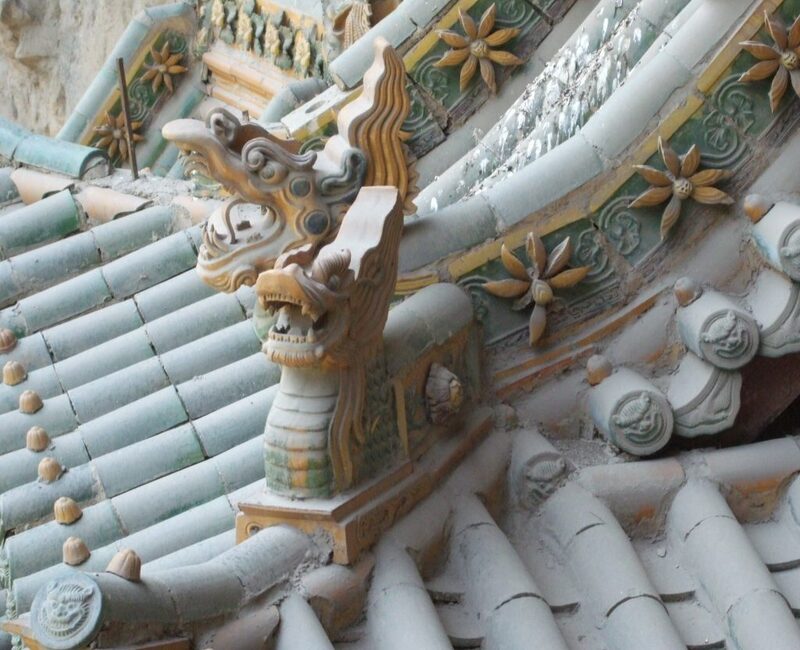 Most surfaces are painted and the detail of the ceilings and roofs is exquisite. 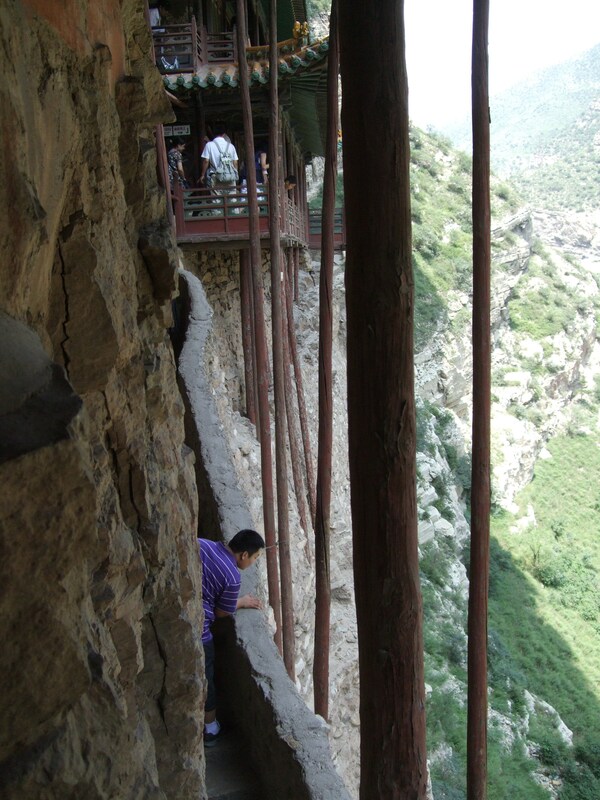 Walkways are narrow and precarious and built of stone or wood. 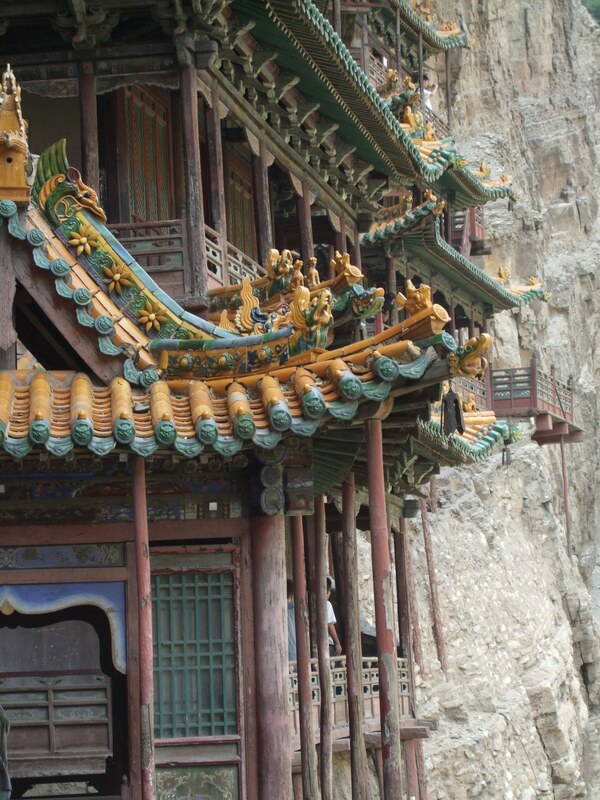 It was built to support a monastic community, keeping it remote by suspending it above a river. Both of these things—the river below and the monastic community—are gone now. 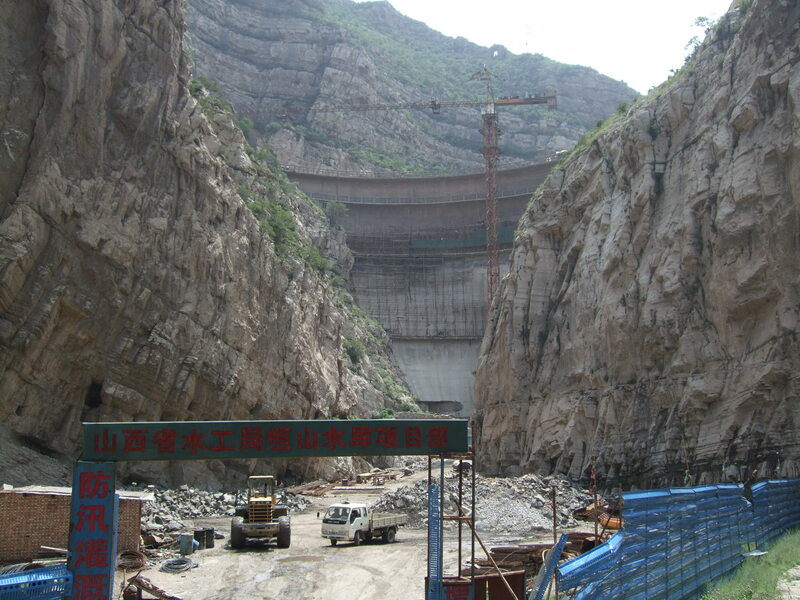 A dam is being built just up the canyon above the monastery. At the moment, absolutely no water is moving through the valley, though it looked a bit muddy so presumably some water is allowed through at times. As for the monastic lifestyle: there are no monks there. There are, however, swarms of tourists and their noise. They drive down the access road honking their car horns (people honk A LOT here). Their tour guides carry portable loudspeakers so that everyone in the place hears everything they say. And if there are two tours near each other, one doesn’t wait for the other to finish; they just both talk louder. The narrow walkways are not designed for the number of people using them; I hope someone is keeping an eye on their condition! Signs tell people to follow one direction through the monastery, which makes sense, given how narrow the stairways and balconies are, yet many tourists ignore the signs and go where they want. I am saddened to realize the amount of dedication and love it took to build a wonderful structure like this, only to end up an overused, crowded tourist attraction. Yet here I am, a tourist, enjoying its beauty nevertheless. Thank you for sharing this–the photos are great, the recounted history and observations worth reading. Sometimes I leave speechless when I see what people are willing to do to achieve what they want. Starting from the building of the dam and literally moving water to make energy right next to the hanging monastery. How did they manage to build this monastery? The definitely had to use glue, haha, that’s the only way how I see it. Haha! I think they built the monastery very carefully and very slowly, given that there was water rushing beneath it! Interesting post, Rachel. Yes, it’s so true that there are places such as this monastery that we will visit and feel mixed emotions about its original purpose and use now. I just got up, so a specific place doesn’t come to mind. But circumstances change and life goes on, so it’s just great that as least people get to enjoy it, rather than it being left to deteriorate or be demolished. I’d love to see you write a book on travel to religious icons. It certainly seems to be your niche! That’s an ironic comment, Doreen, because I’m a very NON-religious person. I guess it’s just that so much of history’s greatest architecture has been built out of religious devotion. I admire that devotion, but don’t feel it myself. Having said that, I’d love to write such a book, partnering with someone who’s a brilliant photographer: anyone out there interested? Lovely piece, I can really understand the internal conflict and sadness of which you speak! I’ll look forward to that, Chris! Thanks! I don’t remember seeing any dam when I visited in 2006. What I remember is huge damage done by so called “Cultural Revolution” when they smashed hands on statues. Or pulled their eyes out. I am surprised the Hanging Temple is still “hanging”! Nice photos!!! Thanks! This was in 2010, so I assume the dam is done by now. It´s so sad to see the damage that unplanned tourism and the so call “evolution” can do to a magical and unique place. Yes, I agree. At least they didn’t tear down the temple. It’s just rather soulless this way! This is SO unique! This is actually the first time that I heard about this and I’m definitely putting it on my bucket list. But indeed, I have to be sensible about the issue of over-touristy places because the original purpose of it gets thrown away out of the window.